"This is a combination of two or three old recipes." In a large bowl, mix together 1 cup white sugar, 1/4 teaspoon salt, 1 cup melted butter, and 3 eggs. Mix and add 1/2 pint sour cream. Mix together yeast with warm milk and 1 teaspoon sugar. Add to mixture. Add flour. Mix and knead. Divide dough into 7 equal parts. To Make Filling: Melt 1 cup plus 3 tablespoons butter. Add 2 cups sugar and stir to dissolve. Add to ground walnuts and mix until coated. Add ground cinnamon and vanilla extract to taste, if desired. Divide filling into 7 equal amounts. Roll each dough ball into rectangle. Spread slightly beaten egg white on top of dough. Spread equal amounts of filling on top of each rectangle. Roll in edges and spread edges with egg whites to seal. Then roll length wise. Brush tops with egg whites. Bake in a 350 degrees F (175 degrees C) preheated oven for 30 minutes or until lightly brown. Cool. These freeze well. 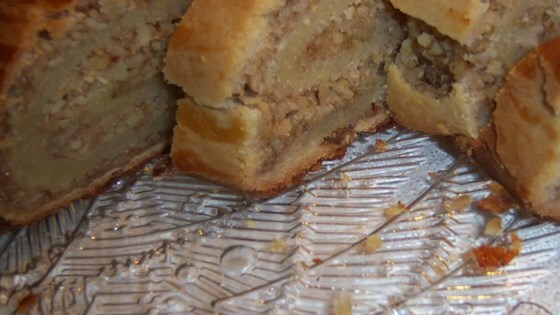 This is the best nut roll recipe I have ever came across.It makes alot but they go fast!